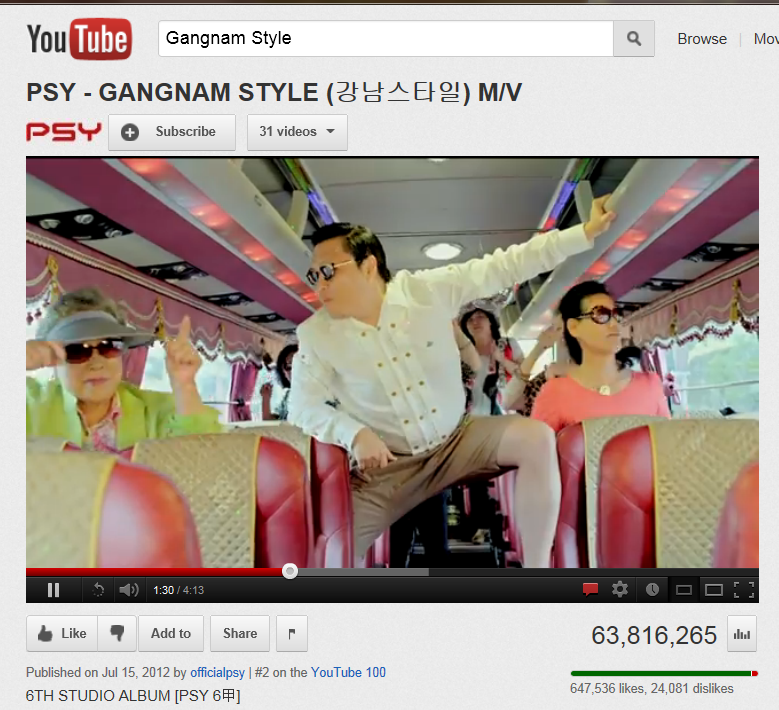 When I started writing this post a few days ago, PSY’s “Gangnam Style” had 50M+ YouTube views and has now exceeded 60M. Not only has the video gone completely viral since its mid-July release, but it has also been widely covered in the news, including CNN, the Wall Street Journal, and the Washington Post but one of the best pieces is by Sukjong Hong. If you’re not in the know, PSY is a S. Korean entertainer whose “Gangnam Style” music video has become somewhat of an overnight sensation. If you look beyond the catchy music and dancing and bizarre style of the video, there is the parody of the moneyed and powerful. It’s a minor detail but Gangnam actually refers to the entire area south of the Han River. Gangbuk is the area north of the Han River. Some of the neighborhoods referred to by “Gangnam Style” and the news covering the viral video are actually Apgujeong, Chungdam and Sinsa, home to the luxury galleries and showrooms of Louis Vuitton, Chanel, Ferragamo, Coach, etc, an occasional S. Korean celebrity sighting, an over-priced Banana Republic store, boutique designer shops and where drink prices and the cover charges for clubs are at least twice that of those in Gangbuk. Supposedly Paris Hilton and Beyonce made appearances at Circle, a posh Sinsa club that is now closed, when they visited Seoul. At one time banned from certain clubs in Gangbuk, American GIs migrated to the club scene in Gangnam. The area around Gangnam subway station is not somewhere you want to be when the language institutes dismiss the final evening class as the streets overflow with students pursuing the tool that will open numerous doors for them: use of the English language. My stylist used to be in Gangbuk and then moved south of the Han River to Chungdam. The price of my haircut went north and the business went south. It was a bit of an irony that I was paying more and yet their swanky new surroundings were actually seeing less business than when they were north of the river. Having clients like Daniel Henney and up and coming JYP stars didn’t help the business and I was merely paying for real estate. I was told at one point that I was in their top 5% of customers. Still not sure exactly what that meant but it resulted in a complimentary head spa treatment featured on MBC that was the best pampering money can’t buy. The salon is still open but business is not what it once was. While I lived in Seoul, most of the time I resided in Gangbuk but I spent a fair amount of time in Gangnam, specifically Chungdam and Apgujeong, tutoring students and I also lived south of the Han for a time. My 1st Gangnam neighborhood, Banpo, was more of a working class area with back street markets but I was within walking distance of BMW and Mercedes traffic jams and the Sinsa neighborhood, which at times felt more European than Korean. This is where I would go for good non-Korean food. My 2nd Gangnam neighborhood was home to JYP Entertainment. Often when I walked to the bus there would be a group of school girls waiting outside the JYP studio in hopes of catching a glimpse of their favorite celebrity. One of my students wrote a paper on the similarities and differences between Gangnam and Gangbuk and pointed out that the school girls’ uniform skirts were shorter in Gangnam. True. There is also more cosmetic surgery in Gangnam. In addition, there is also a derogatory term for those who live in Gangnam. At the same time, Itaewon, located north of the river and sometimes referred to as “the armpit of Korea,” is opening a number of upscale restaurants, definitely not targeting budget travelers. PSY has always seemed controversial and bizarre and pushed the envelope. I’m not a huge fan but do find him interesting. I think his popularity stems in part from the fact that he is not the stereotypical K-pop star. I’m interested to see what will happen next. Will his success in the US continue or is this just an isolated incident? Are people really enjoying him as an entertainer or are they actually making fun of him? Is it a case of enjoying Asians on stage only? Will he be able to sustain his overnight global popularity? Hollywood and US entertainment have exploited S. Korean entertainment for some time with film remakes so one has to question if PSY will now also be exploited or better yet, will he allow it. He was in LA earlier this month to discuss possible career options in the US. With all the media coverage and tweeting about “Gangnam Style” one thing that has not been mentioned is the fact that S. Korea has enjoyed post-war economic recovery partially as a result of exporting approximately a quarter million of its citizens through inter-country adoption (ICA). Matthew Rothschild wrote “Babies for Sale” prior to the Seoul 1988 Olympics. In his piece, Rothschild questions the system where numerous S. Korean children are being sent away to western countries. ICA is now a multi-million dollar industry which systematically incorporates numerous human rights violations, yet continues to be seen by some as a humanitarian effort. Contrary to popular belief, most of the children (about 1,000 per year) being sent away today are not coming from orphanages. They have families. Single or unwed mothers who desire to raise their children but due to societal stigmas they face an enormous amount of pressure to relinquish their children for overseas adoption. S. Korea has yet to develop a comprehensive social welfare system that provides services for everyone, regardless of class and social status. Thus, the economy has never had to support everyone – just those who fit a certain profile. Had S. Korea taken care of its own children, would Gangnam even exist as it does today? Would PSY’s video have been produced and gone viral? E. Lee is a 1.X generation Korean American who lived in both Gangbuk and Gangnam 2004 – 2008 and who hopes for a day when ICA from S. Korea is no longer necessary. Amanda serves the adoption and foster care communities through individual and family clinical work, group work, writing and presenting, and policy advocacy. Her writing and presentations reach broad audiences through multiple books, magazines, news and radio interviews, and conferences, and she has engaged legislators at the state and congressional levels. Her writing and work focuses on the experience of being adopted, intersecting social justice issues, and adoption community centered & initiated movement toward positive change. Amanda is a Yahoo!Voices featured mom activist and is listed in the Top 20 Adoption blogs by Adoptive Families Magazine. hello there and thank you to your info ?I have certainly picked up anything new from proper here. I did however experience a few technical issues the use of this web site, since I experienced to reload the web site a lot of instances prior to I may get it to load correctly. I have been thinking about in case your web host is OK? Not that I am complaining, however slow loading circumstances occasions will sometimes have an effect on your placement in google and could damage your quality score if advertising and ***********|advertising|advertising|advertising and *********** with Adwords. Well I抦 adding this RSS to my e-mail and can glance out for much extra of your respective interesting content. Make sure you update this again soon..